Nicholas Harbour and his wife Colleen came by their vocation in wine honestly, and jumped into the cuve with both feet. The American-Canadian pair met while only teenagers in Luxembourg, and after the inevitable peregrinations of their twenties, fell in love and landed back in Luxembourg in 2008, alighting in roles in the finance industry. Wine was a burgeoning passion in their lives, especially the Pinots Noirs and Chardonnays of Burgundy. This led to daydreams. One evening after a long conversation about the kind of lives they wanted to lead, and the kind of story they wanted told about their lives—daydreams became plans. After wine school in Beaune, in 2012 they leapt into the vat, moving to Savigny-les-Beaune and establishing their own tiny négociant house. Maison Harbour was born. Two children also followed: Jack in 2016, and Madeleine in 2018! In the early days of their enterprise—with their families still scratching their heads about their decision—it wasn’t easy to get started buying fruit. Pristine, world class grapes didn’t just walk in the cellar door. Brokers proposed sites that were poorly tended, or just unexciting. Slowly but surely, the friends Nicholas and Colleen made in wine school began to make connections. A brother, a sister, or an aunt emerged with great fruit to sell. When their first fruit came in the door of their garage cellar in 2013, it was almost as if the pair were caught by surprise, as if making wine was an afterthought. No new barrels were available, or really desired, and still none are used today, in favor of two to six-year old vessels. The cellar remains very basic; all ferments are indigenous, temperatures are essentially uncontrolled, and until 2017, juice was extracted via an old, manual basket press. Today an electric basket press gives Nicholas and Colleen more control over extraction, which is extremely gentle in every vinification. As in 1 pump-over and 1 punch-down-by-foot gentle. For many wineries these are daily procedures, but here they are annual. 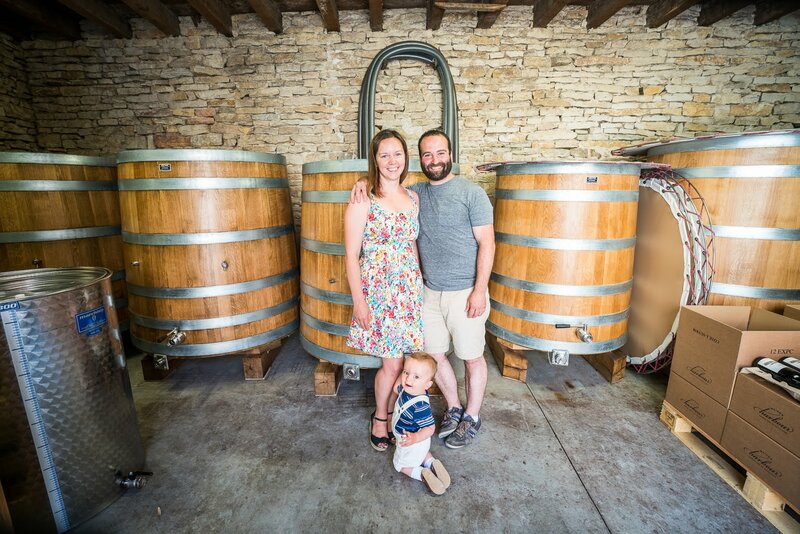 So it should come as no surprise that the wines that emerge from this rudimentary winery, powered by nothing other than a young family, are wines of finesse and transparency, where a place and time have been captured and transmitted to bottle. Though it may seem that they arrived at this goal haphazardly, each glass of Maison Harbour burgundy brims with this intention.